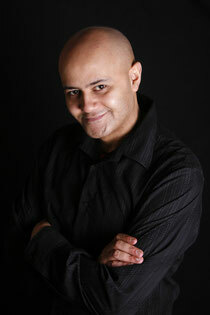 Nik Coppin is a mixed race London-based international stand-up comedian. He has a confident, affable and energetic approach to comedy which is quick to build audience rapport and his versatility is such that he can easily switch from compering to opening and closing sets, and to doing solo shows. His shows and material range from topics as diverse as race-related issues, animals, superheroes, observations on everyday life, storytelling, and shows that have incorporated his own cartoons and caricatures. Nik has performed all over the world developing an international fan base through a variety of shows that he also produces. He is one of the few comedians to enjoy success on both the UK comedy circuit and at international festivals. He has performed at the Edinburgh and Adelaide Fringes, New Zealand and Melbourne International Comedy Festivals, all over Australia, and at the inaugural Hollywood Fringe Festival in Los Angeles. The shows that he produces and comperes - the late show Shaggers and the family friendly show Huggers - have proved very popular brands over the years and regularly sell out to festival audiences. Nik is currently developing his critically-acclaimed show Mixed Racist. He often talks about his heritage on stage - his mother is English and his father is from Barbados, but this show marks a slightly new direction for the affable comedian; more relevant, controversial, and thought-provoking, while never straying too far from his friendly comedic roots. Mixed Racist will be seen at the Australian and New Zealand comedy festivals before it returns to the UK for tour dates throughout 2014, with possible dates in the USA and Caribbean to be announced. "Charmingly hilarious host Nik Coppin’s comedy was effortless; engaging the audience’s attention with almost no effort at all"
“Coppin is clever and manages to captivate the audience at every turn"
"He talks at 100mph and generates an irresistible atmosphere of good old-fashioned fun"
"The banter is slick and engaging. He goes off on the sort of wild tangents beloved of messers Izzard and Noble"